US employment data points to a disappointing Nonfarm Payrolls report. American trade deficit widens to its largest in ten years in October. The EUR/USD pair remained depressed around 1.1330/50, as risk aversion ruled the first half of the day. Trade war relief vanished, Italy refuses to consider a deficit target of 2.0%, and there's only one valid alternative to Brexit, UK PM May's deal. Equities and bond yields are under strong selling pressure, with European indexes down by more than 2.0%. And in the middle, US employment data ahead of Friday's Nonfarm Payroll report. The country has already released November Challenger Job Cuts, which showed that the number of planned layoffs announced by US-based employers totaled 53,073, below the previous 75K. The ADP survey for the same month disappointed as the private sector added 179K, below the expected 195K and the previous 225K. Initial Jobless Claims for the week ended November 30 were up to 231K, while the Unit Labor Cost rose by just 0.9% in Q3. Nonfarm Productivity in the three months to September came in as expected at 2.3%. The data was generally disappointing, pushing the dollar lower against most major rivals, although with uneven results as equities remain at the lower end of their daily ranges. Furthermore, the US trade deficit increased to $55.5B, the largest in ten years. Still pending of release are the Markit and the official ISM Services PMI for November. 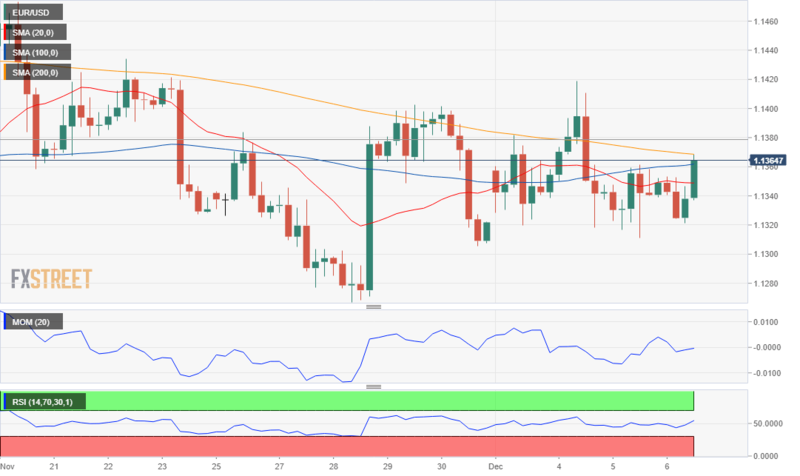 The pair trades at daily highs post US employment data, maintaining a neutral short-term stance in its 4 hours chart, with the price battling with directionless moving averages and technical indicators heading nowhere around their midlines. Still, the pair is trading above its Wednesday's high and could continue recovering short-term. Seems unlikely, however, that it could extend its gains beyond the 1.1420/30 price zone as there is no background that can spur EUR's demand.